A visit to the Blue Ridge Parkway is the perfect daytrip at Grace Ridge. At Grace Ridge Retirement Community, our location in the foothills of Western North Carolina means easy access to the Blue Ridge Parkway, one of the most celebrated and beautiful scenic drives in the country. The parkway is over 350 miles long and stretches from North Georgia to Pennsylvania. 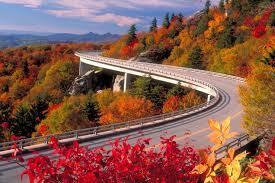 The Blue Ridge Parkwayis over 6,000 feet at its highest elevation with an average elevation of 3,000 feet. Along the way, visitors can enjoy scenic vistas, hiking, canoeing, camping, picnics and more. The parkway is also home to numerous mammals, birds, reptiles and fish. It is not uncommon to see deer grazing in a field or a bear crossing the highway. For photo buffs, the Blue Ridge Parkway offers breathtaking views, waterfalls, rivers and landscapes like no other place. For more information on the parkway, you can visit the National Park Service page here.